Panzerkampfwagen VI ausf B Tiger IIs of Panzer Ersatz und Ausbildungs Abteilung 500 (Replacement and Training Battalion 500) on the firing range at Paderborn. Turmnummer (turret number) 324, the Tiger II closest to the camera has a Porscheturm (Krupp Turret for the Porsche Tiger Design) and a early "monoblock" one-piece barreled 88mm (3.46 inch) KwK 43 L/71 main gun. Turmnummer 323, the tank behind it has a porscheturm and a two-piece barrel, simpler to manufacture, introduced in May 1944. Panzer Ersatz und Ausbildungs Abteilung 500, formed on December 20, 1942, was the final stop for many Tiger crewmen before joining combat units. The training at Paderborn placed an emphasis on gunnery practice above all else; General Heinz Guderian (June 17, 1888 - May 14, 1954) as Generalinspektur der Panzertruppen (Inspector-General of the Armoured Troops) shortened the crew training time as the war consumed more and more of the panzertruppen's trained cadre. All the Tiger training units were folded into Abteilung 500 on February 8, 1945. 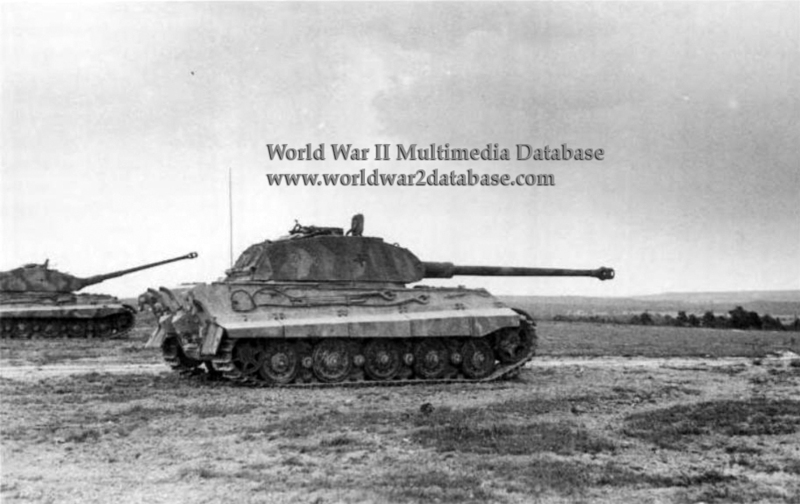 Panzer Ersatz und Ausbildungs Abteilung 500 supplied Tigers to 3.Kompanie/Schwere Panzer Abteilung 501 in their unsuccessful defense of Paderborn against the British on April 1, 1945.